Wabash’s theater majors and minors are getting some hands-on experience in their studies. The Theater Department is hosting three workshops this week, all designed to give students access to professionals in the business. "This is part of an ongoing effort to bring in more pros; to build a skill base and also allow the students to network and make connections with people involved in professional theater," said Professor James Phillips. Last Saturday, Indianapolis-area actor and instructor Rob Johansan led students through a rough-and-tumble workshop called "Hand to Hand Stage Combat," which honed the students’ stage fighting skills. See photos of the workshop, which was held in the wrestling room, here. "Rob is a professional actor and fight master who has choreographed dozens of fight sequences for theatre and opera," said Phillips. "His workshop focused on safe hand to hand (non-weapon) fighting techniques and beginning fight choreography." Johansan also led a movement workshop at Wabash last year when his wife Jennifer appeared as a guest actress in The Elephant Man. On Thursday, the New York-based Wakka Wakka Productions presented a workshop focused on performing with puppets. "They will be working with us on the basics of puppet and object movement before performing Friday evening as part of the Visiting Artists Series," said Phillips. This Saturday, the Wabash community will have the special opportunity to work through a Lessac Body and Vocal Energy workshop with Professor Caroline Good from DePauw University. Professor Good will play Gwendolyn in the upcoming Wabash Theater production of The Importance of Being Earnest. "Caroline will be helping us strengthen our bodies and voices using the Lessac technique," Phillips said. "The technique offers actors an approach to voice, speech and movement that integrates all three to deepen communication and creativity." Phillips suggests attendees wear clothing that allows for freedom of movement. The Lessac workshop will be held in the Wrestling Room in the Allen Center. "All of the workshops are primarily aimed at our majors and minors, but are open to the public," added Phillips. "We hope to broaden our students' skill set and also familiarize them with the realities of professional performance. 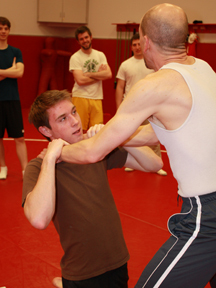 In the photos: Above right — Fight instructor Rob Johanson shows the proper way to choke a fellow actor, in this case Reed Hepburn ’12. 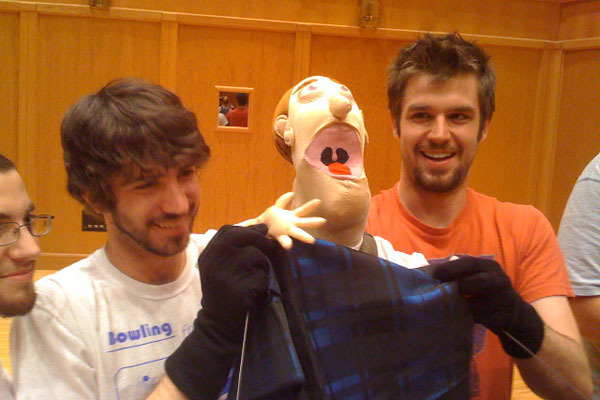 Above left: Matt Goodrich ’09 works with a puppet provided in the workshop put on by Wakka Wakka Productions, a Visiting Artists Series group.